Rory, a longstanding supporter of the Penrith Mountain Rescue Team, has backed its plan to build a new base following a recent visit. The Penrith Mountain Rescue Team is based in Tynefield Drive in Penrith but has grown too big for its buildings. As a result, it is planning to build a new base for the long term, capable of accommodating future expansion. Plans have been drawn up by a local architect and the Team is preparing to submit their planning application. Prior to its submission, its leaders requested a meeting with Rory to discuss the plans and he was delighted to comply. Rory has been a committed supporter of the Team since his election in 2010, and has served as the Chairman of the All Party Parliamentary Group on Mountain Rescue in Westminster, championing the service nationally and supporting its efforts locally. 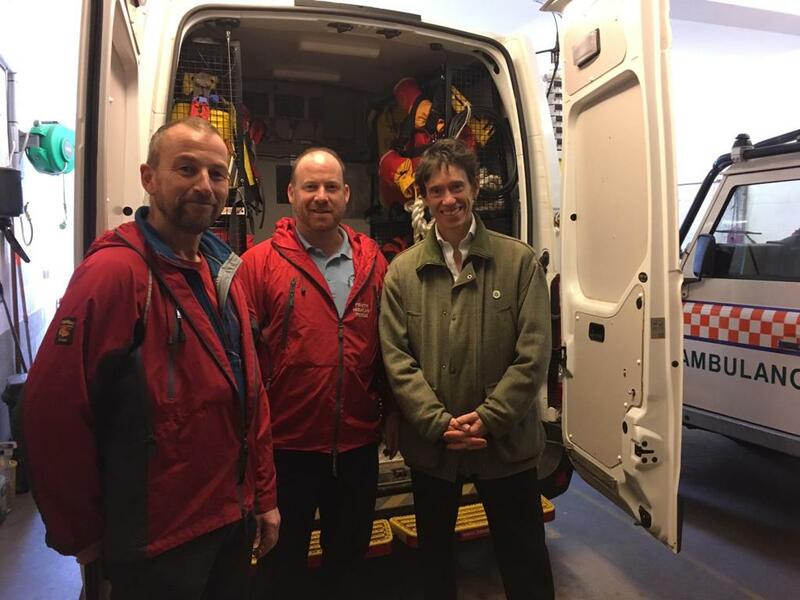 Consequently, Rory was delighted to offer his support to the Penrith Mountain Rescue Team in its bid for bigger headquarters. On his recent visit, he was shown the limitations of the current base and received an update on the Team’s work and functions from Kaz Graham, who made the case for the new headquarters, which they would like to build at Kemplay Roundabout. This site has the advantage of being closely placed to the Fire Station and the Police Station, which will facilitate cooperation between the services. A funding drive will be necessary in due course but, for the time being, Kaz explained, the focus is getting Cumbria County Council, who own the land, onside. Rory, thanking Kaz and the team for all their work, pledged his support for their move. Rory said, “It was a very great pleasure to visit Penrith Mountain Rescue, to thank them for all that they do, to hear once again about their amazing work and to back their bid for a new HQ. The Mountain Rescue is an inspirational and incredible example of public service, performing acts of heroism day in and day out and I will do all that I can to support them. I am behind them in their plans to relocate and I look forward to seeing them in their new home in due course”.